Super soft and breathable, this scarf has a secret weapon: odorless bug repellent. A garden party on a warm evening. Conversation blossoming. Wine glasses reflecting sunset's glow. Night falls... and here come the mosquitoes. Paradise lost! Bug spray doesn't pair well with fresh-picked herbs and Sauvignon Blanc, so you nixed it. 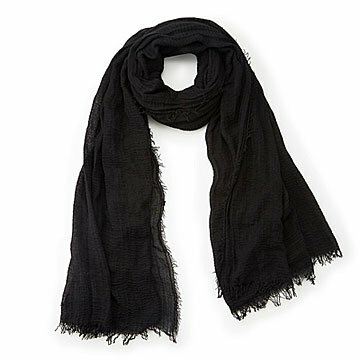 Next time, you'll have a new secret weapon: this gauzy, soft, breathable scarf, permeated with an odorless bug repellent. Paradise regained. Originally developed to protect the US Military and Marine Corps and successfully used as an EPA-registered repellent, it repels mosquitoes, ticks, ants, flies, chiggers, and midges (no-see-ums) for up to 70 washes. Made in China. Hand wash, cool water. Do not dry clean. Air Dry. Easy, bug spray free way to stay bug bite free! Wonderfully light, simple to pack and wear scarf on buggy summer nights. This product was great! Purchased to use while traveling in Bahamas with family. Anywhere it covered on my body it repelled insects and received no bites. Would love if it was blanket sized, but performed as promised and would buy again! Soft, doesn't smell like some treated product and kept me from being bitten and itchy. Excellent product! I love it. I recently moved to the east coast from LA - and the bugs here are killing me! This scarf saved my summer and looks great too! One of those zero sum things. So far we've seen no bugs!